Our story involves a love of art, a newsagency and the fabulous colours of soft pastels. During 2006 Stephen & Joanne Evely took over the Adamstown Newsagency located in Newcastle Australia and soon started looking for new products to offer and ways they could serve the community. Art supplies seemed like a natural fit for Stephen & Joanne and after a tentative first few steps they were overwhelmed with the response. Newcastle already had a reasonably decent general art store so Stephen & Joanne decided to concentrate on providing more variety for the local artists. As they continued to build their range they very quickly realised there was a great interest in soft pastels. 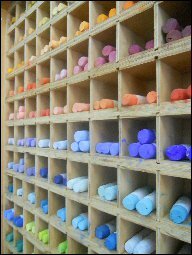 This pent up interest in soft pastels from local artists and the fact that Stephen & Joanne had fallen in love with the colours of soft pastels eventually led to the best range of soft pastels in Australia being built up. Word was spreading about the range available and many requests for an on-line ordering system were received. Softpastels.com.au is the result of these requests. As with our story so far the softpastels.com.au web site will continue to grow and many new products will be introduced over time. Stephen & Joanne would like to thank you for visiting Softpastels.com.au and extend their personal philosophy to you that all customers will be treated as if they were a friend.